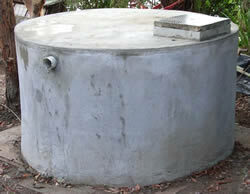 A1 Tank Services can supply and install concrete underground tanks for domestic locations. These tanks can be covered with soil and turf and can be driven over. These tanks have a heavy reinforced roof and are wedge shaped to prevent uplift. A1 Tank Services can also build larger underground tanks on site - subject to access - see domestic concrete tank construction. Install an underground tank and save space in your yard. Copyright © 2001-2017 A1 Tank Services. All rights reserved.